The magical "RS" label has a long-standing tradition and makes the hearts of all motorsport enthusiasts skip a beat. In homage, the REFERENCE RS utilizes a stronger servo-motor with a modified re-chargeable battery pack. Bonex relies here on its proven Li-ion battery technology. The custom-developed, high-performance propeller “Speed” has been optimized to most efficiently transform the power into forward thrust. At moderate speed, the RS is still able to achieve excellent runtimes with sufficient power reserve. That’s why this model is particularly well-suited for areas with strong currents. 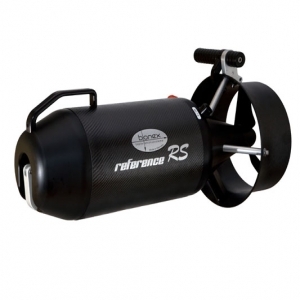 Even with a sizeable payload, the "RS" continues to offer ample thrust. Naturally, the discriminating user will find Bonex’s comprehensive safety features built-in to our “super-charged” model as well.